THURSDAY, APRIL 11, 2019 AT THE GROWING UP GREEN SCHOOL, 39-27 28TH ST, LIC AT 7:30PM. Our first spring meeting will be held on Thursday, April 11th, at 7:30pm at the Growing Up Green School, 39-27-28th Street. Our featured speaker will be a real estate assessor from the Department of Finance. The DOF assessor will explain how your real estate taxes and assessed property values are determined. The assessor will answer all your questions and give us information specifically connected to Dutch Kills. In addition, ACES has applied to get a new liquor license and we need your help and participation in the fight against it. Also, our lovely Windmill Community Garden is recruiting volunteers for its spring planting. The curator for the garden will be presenting details about the garden. As always, we expect representatives from the 114th PCT, Van Brammer’s office, Brian Barnwell’s office and Senator Gianaris office to hear and address any issues you may have. Hope to see you and any other neighbors you can bring to our meeting. The community is bounded by 34th Avenue on the north, on the south by Bridge Plaza north, on the east by Northern Boulevard and on the west by 21st Street. The Queens Plaza transportation “hub,” located at the doorstep, provides instant access to all MTA subway lines and the iconic Queensboro Bridge. Our community is located minutes from the Lincoln and Holland tunnels, the Robert F. Kennedy Bridge, the Grand Central Parkway, Brooklyn Queens Expressway and the Long Island Expressway. LaGuardia Airport is located just north of the community and JFK International Airport may be accessed by car via the Grand Central Parkway, or the MTA “Train To The Plane,” at the Queens Plaza transportation hub. The Association of Long Island City, Inc., welcomes manufacturing and commercial interests to our neighborhood, in a unique partnership of a growing residential and business community working together for an even better! Come and explore the advantages of living and working in … The Center of It All! 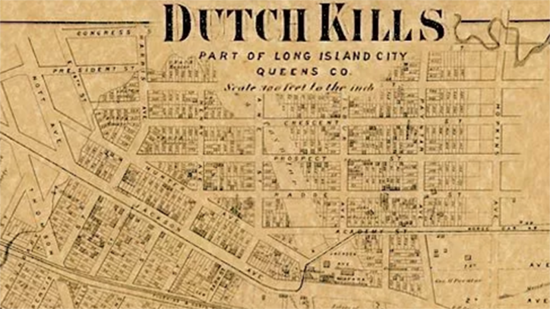 New to Dutch Kills? Looking for a great restaurant? Somewhere to stay? The local zoning laws? Relax. You’re here. You’ve come to the right place. Explore these pages to find everything you need in and about. Find our great restaurants, stores, banks and more in our Merchants section. Come join us or find out about local events! Most importantly, come share the excitement of this unique, historic, revitalized community! All Roads Lead to Dutch Kills ©2019Dutch Kills Civic Assoc.